I have always been annoyed that for a stock game (I will address FAR later) adding nose cones to a rocket was counter productive, even if it looked nice. So I decided to fill them with fuel. While adding a mod like FAR will make nose cones useful again, it does change the way the whole game is played in atmospheres and some people don't want to do that. Also any coded mod can have problems when KSP updates. I realise that I am using the brilliant ModuleManager, but due to it's nature it is less likely to have update problems. As all this mod does is add fuel to items it is also very unlikely to break even if ModuleManager does. With the introduction of Tweakables adding fuel to an item is also reversible without taking out the mod and as it's mass it not changed (apart from tow of them) it is almost exactly the same when empty. The Technical part: The first thing I did was decide on which parts to add fuel to. 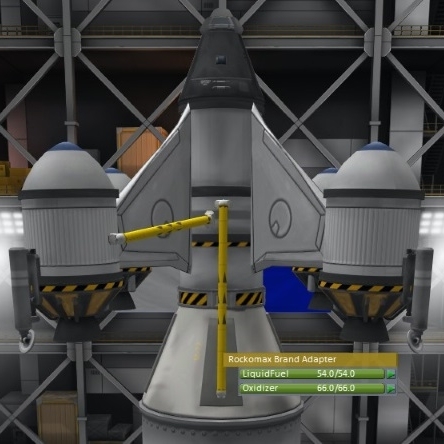 I decided on all adapters and nose cones that didn't have another purpose (intakes and air sensors are not included) and looked big enough to have fuel in them (FL-A5 Adapter is too flat). Next I used their mass and the mass to fuel ratio of standard tanks to work out their fuel. Most tanks have a empty fuel to mass ratio of 0.000625 (less is better) so I added the fuel at 0.000833. This means they are less mass efficient than most tanks. I can always make them less efficient if people think this is too high. Finally I added fuel and oxidizer in 11:9 ratio to the parts based on their starting mass. After all this I found the tiny nose cone held more fuel than a FL-T100 Fuel Tank and had the same mass as ten RAM intakes when empty. It is also three times heavier than the next largest cone. I suspect it's mass is a type and should be 0.01 not 0.1. So I changed it to such and its fuel is now 5.4:6.6. I also reduced the tiny to small adapter to 0.1 from 0.3 for the same reason.